CAUTION: Detergent below is harmful if swallowed. If ingested, drink large amounts of water. In case of eye contact, flush thoroughly with water. Contact a physician in either case. Avoid excessive skin contact. KEEP OUT OF REACH OR CHILDREN OR PETS. Purpose: To maintain a clean and sanitary water reservoir in your espresso machine. We do not recommend placing your water reservoir in an electric dishwasher unless clearly stated by the manufacturer in the instruction manual. Frequency: If machine used greater than once every 3 days, clean every 14 calendar days, or if machine used less than once every 3 days, clean every 7 days. Machine identity: These instructions are provided for cleaning a removable water reservoir in a traditional espresso machine. Power off your espresso machine and unplug the electrical cord from the wall outlet. Inspect the water reservoir for cracks, damage, algae, or a white film (limescale). If the water reservoir has a crack, algae, or damage, please replace. NOTE: Most manufacturers will not cover cracks on plastic or damages under warranty. 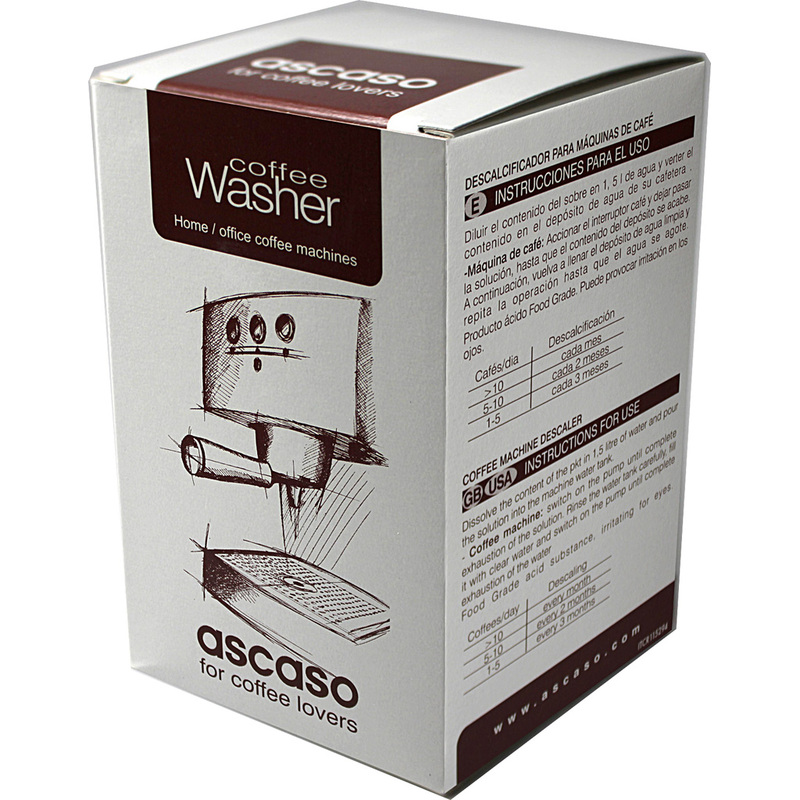 If the water reservoir has a white film, please descale the reservoir using Ascaso Coffee Washer and rinse. Place in 1 teaspoon of mild, non-abrasive dishwash detergent and fill with hot water until soap suds reach top of reservoir. Use clean, non-abrasive sponge dipped in cleaning solution in water reservoir to clean inside and outside of water reservoir. Turn water reservoir upside down on dish rack to allow to fully air dry. Fill reservoir with your water and instal back into the espresso machine.